People in New York love to complain about their cockroaches and rats and bedbugs, but deep in the heart of Texas, residents are faced with decidedly larger kinds of pests. Feral hogs have spread far and wide, and Texas has decided enough is enough. That’s right, folks: The state wants you to hunt them from the safety of a hot air balloon. Last night, Texas lawmakers passed House Bill 3535, which allows landowners to hunt down hogs (and coyotes) via hot air balloon. The bill will now move on to Governor Greg Abbot, who will presumably sign off on it, as it isn’t doing anything scary like protecting the rights of the LGBTQ community or funding Texas’s flagging public school system. But why hunt down these delicious pork products? As it turns out, feral hogs can be a major nuisance animal, rooting up gardens, destroying crops, and damaging fences. According to researchers at Texas A&M’s Agriflife Extension program, they cost over fifty million dollars in damages per year. They also breed quickly, and have few natural predators in this day and age. That’s led to a population boom in recent years. “We predict that large portions of the USA are in immediate risk of invasion,” researchers at USDA’s National Wildlife Research Center claimed in a paper back in February. Pigs are invading, and could be coming to a county near you. At least, that’s what a new study says. Efforts to curtail the invasion have included encouraging the hunting of feral hogs on the ground, as well as chemical warfare, a method approved by Texas Agriculture Commissioner Sid Miller back in February. “This is going to be the hog apocalypse, if you like: If you want them gone, this will get them gone,” he told the Austin American-Statesman at the time. Miller was also behind Texas’ last big publicity seeking hog bill. In 2011, he penned the eye-catching bill that allowed Texans with a gun and some cash to hunt hogs from a helicopter. But while the ability to hunt hogs like Sarah Palin hunts Alaskan wolves has created a bizarre new tourism industry, it has done little to curtail the porky invasion. “The hogs have gotten smart. They kind of recognized what those rotor sounds mean, and they’ve headed for heavy cover,” Steve Lightfoot, a representative for the Texas Parks and Wildlife Department, told Dallas News back in 2012. Keough also claims that the balloon is a more stable platform for taking pot shots at Porky Pig. But let’s be real: Descending into the feral hog population with a ballon and a few .30-06 Springfield rifles has nothing to do with genuinely bring the population down to manageable numbers. 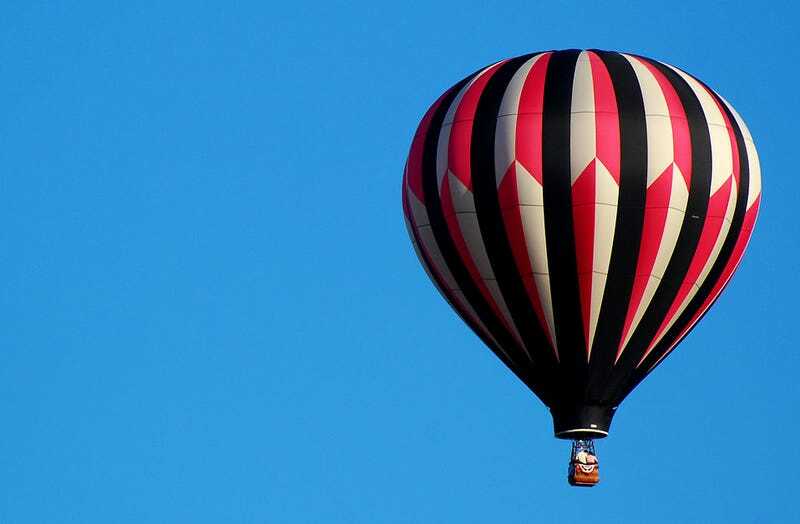 After all, how many people are actually going to go up in a damn hot air balloon?